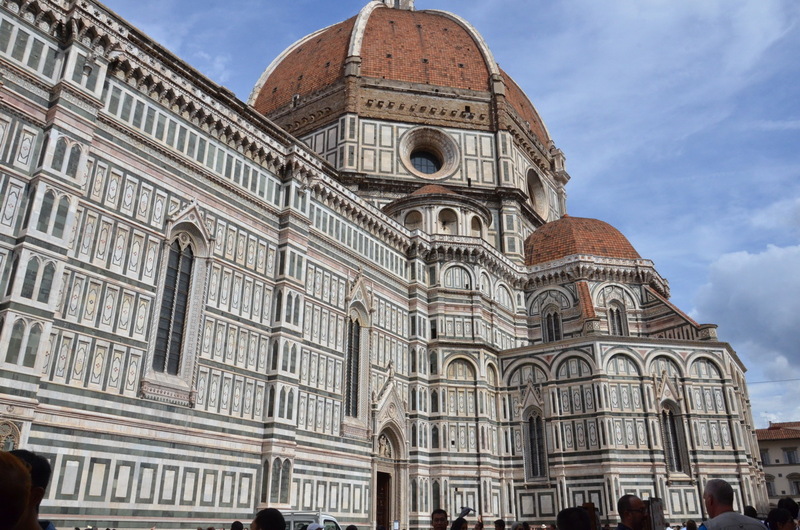 The day that Bob and I headed out to explore Florence, we were anxious to discover everyone’s fascination with the highly renowned Florence Cathedral, in Italian known as the Il Duomo di Firenze. 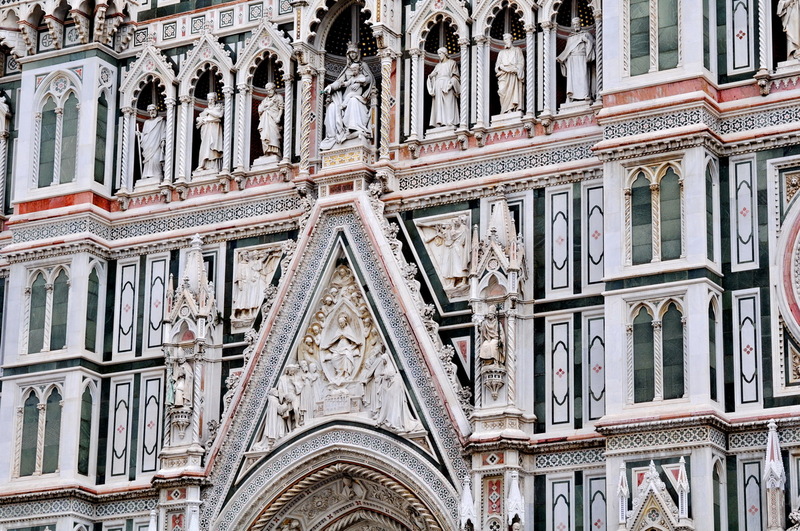 After arriving in the city, we did not go directly to Piazza del Duomo but instead heightened our anticipation by viewing many other sights in the city. It was a pleasant walk to Piazza del Duomo though the narrow streets were clogged with enthusiastic tourists. 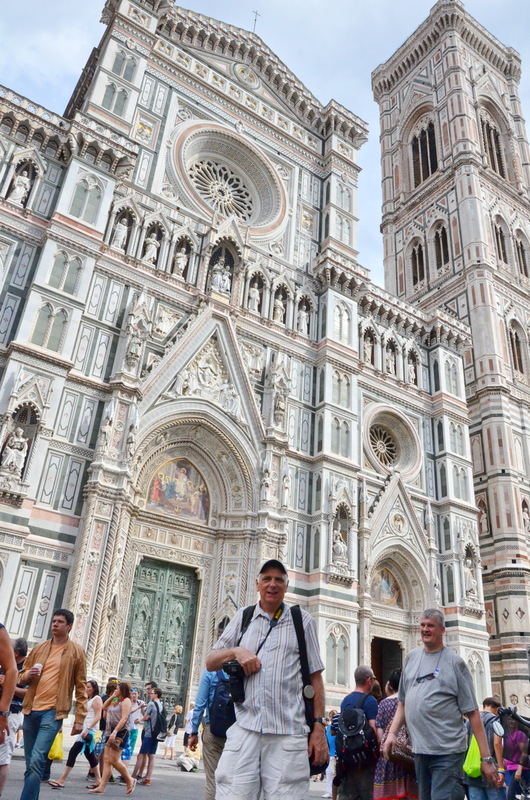 And when we got our first glimpse of the Florence Cathedral, we were gobsmacked! 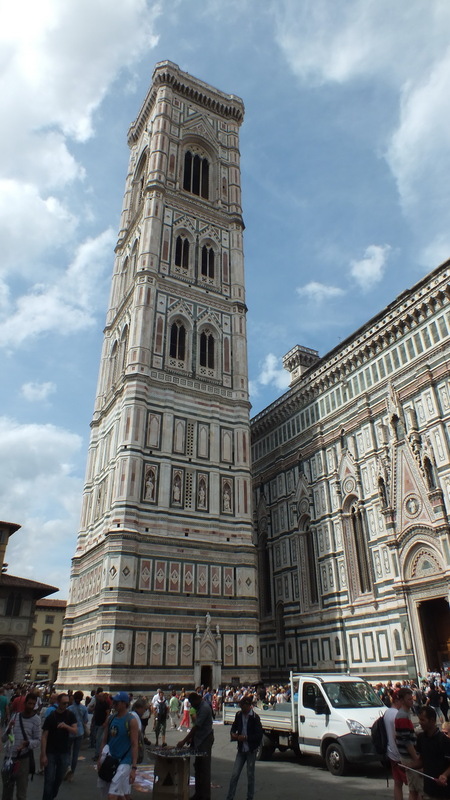 Going by several names, Cattedrale di Santa Maria del Fiore (Cathedral of Saint Mary of the Flower) and Il Duomo di Firenze, the magnificent cathedral rose to such heights and was so exquisitely decorated that we just gazed at it in awe. 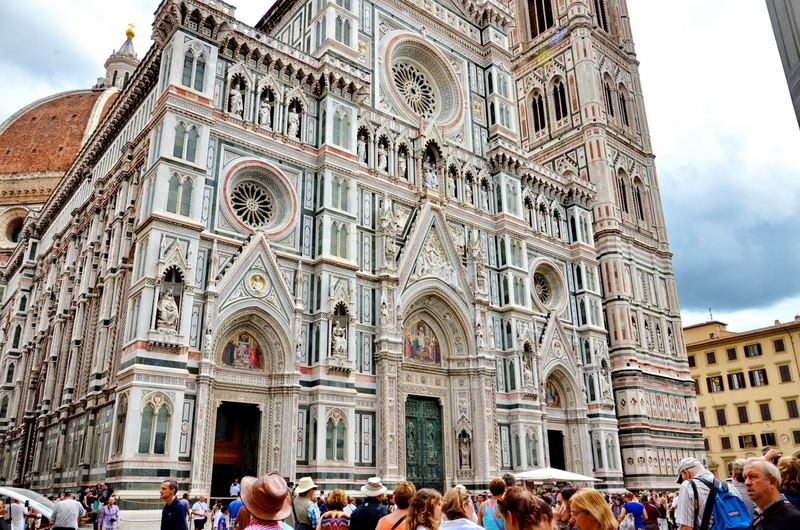 There is so much history associated with Il Duomo that we couldn’t possibly come to grips with all of it when visiting Florence. It was enough just to view the magnificence of the various buildings in and around the historic Old Quarter. 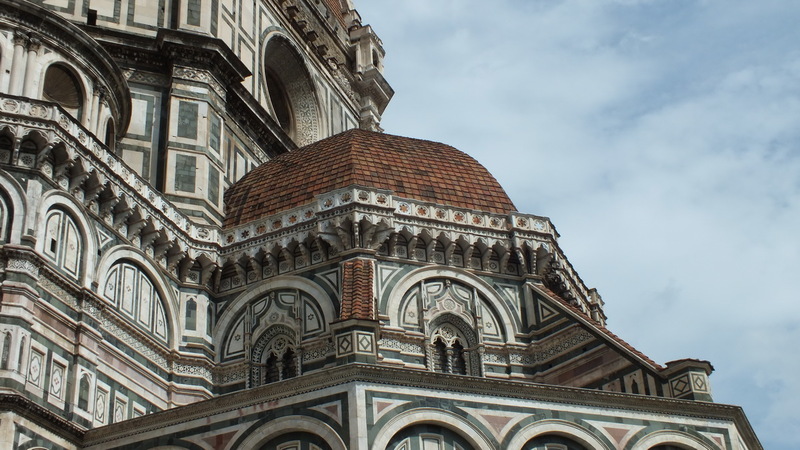 The construction of the Florence Cathedral spanned 140 years beginning in 1296, and so it goes without saying that the work began by one designer, Arnolfo di Cambio, had to be carried on by another known simply as Giotto. Lapses in construction occurred for various other reasons, too, one being the outbreak of the Black Plague in 1348.
and master goldsmith Filipo Brunelleschi beat out one of his very able peers. 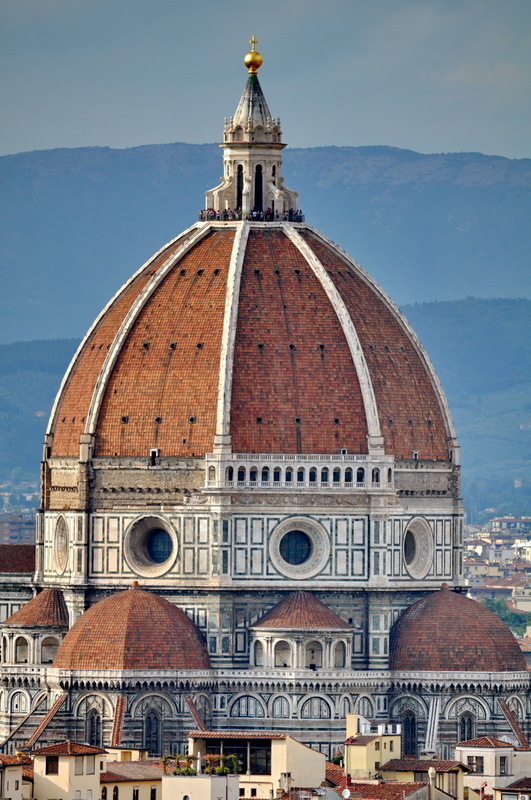 We have since watched the docudrama Medici: Masters of Florence which brought to life the struggles that surrounded the controversial building of Il Duomo. 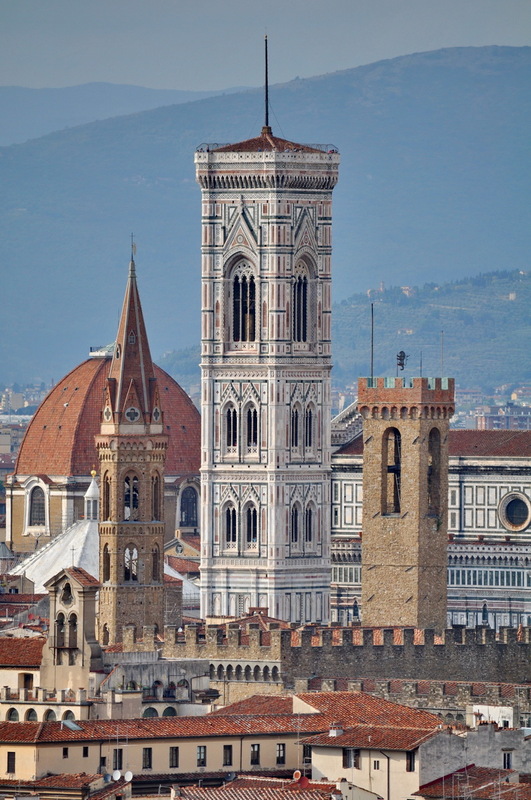 It was Cosimo de Medici who dreamed of Florence being the artistic and cultural centre of Italy, he being an artist himself, so he strongly supported Brunelleschi and believed in his vision and abilities. 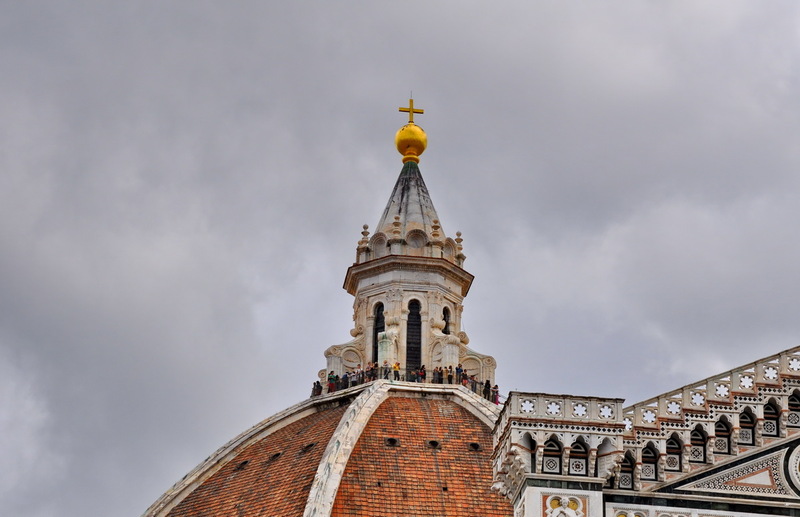 Over the course of 16 years, Brunelleschi successfully constructed the first octagonal dome in history to be built without using a temporary wooden supporting frame. 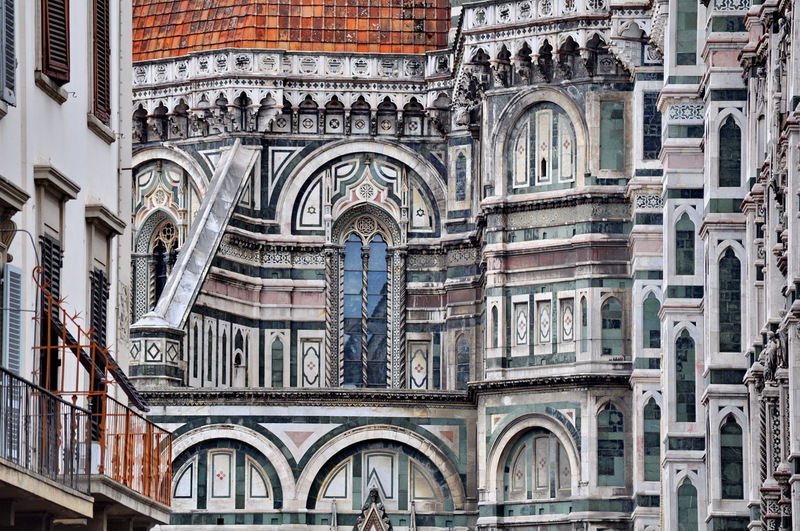 It is considered one of the most impressive structures built during the Renaissance. 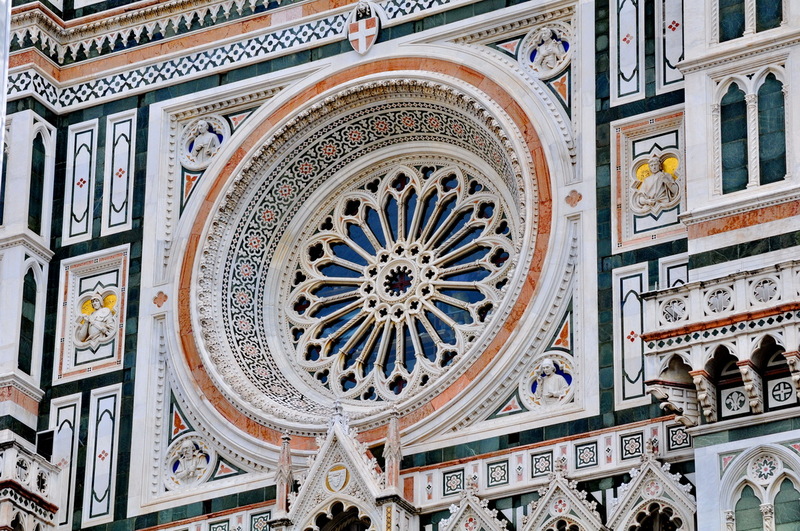 The volume of detail on the exterior of Il Duomo took our breath away. The sheer magnitude of the marble veneer that covers the complete exterior façade defies comprehension. The amount of skilled labour that went into sculpting the red, green and white marbles into amazingly intricate designs and statues explains why it took 500 years to complete the ornamentation. The quality of design detail and craftsmanship was staggering. Nothing could have prepared us for the spectacle upon which we cast our eyes. All Bob and I could do was stand back and gawk at the incredibly beautiful facades. 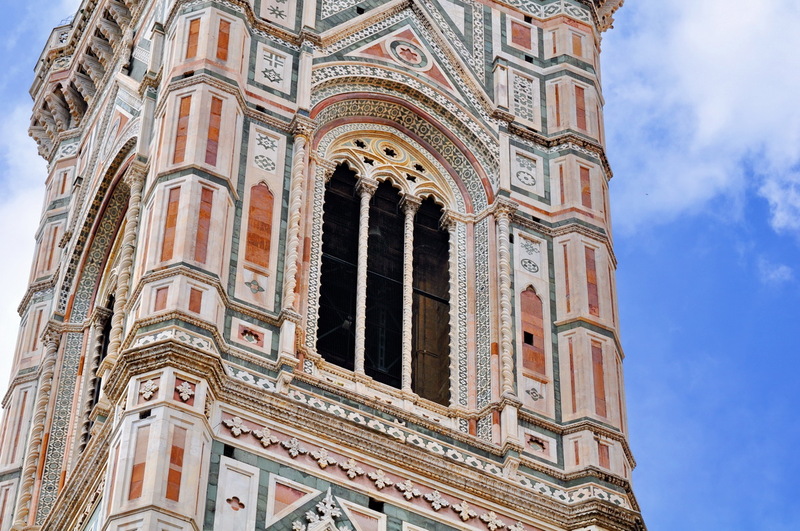 Adding to the splendour of Il Duomo is the freestanding bell tower called Giotto’s Campanile. This freestanding bell tower also exhibits rich sculptural decorations and marble encrustations and is looked upon as one of the showpieces of Gothic Florentine architecture. 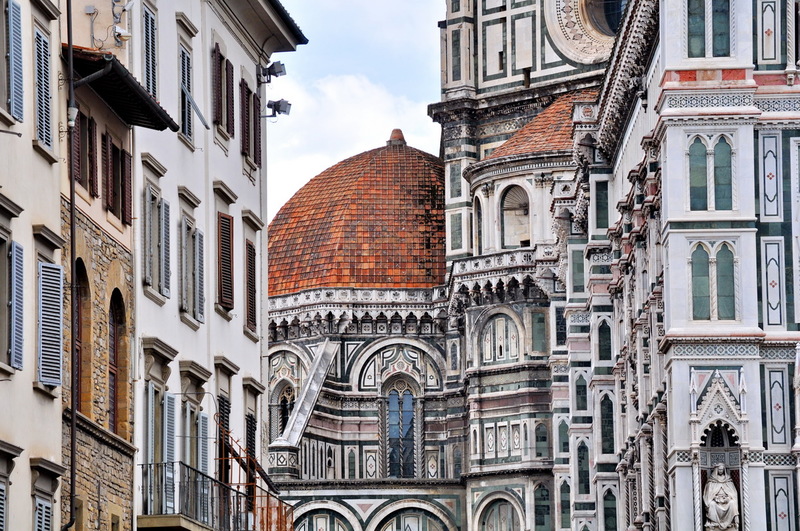 For their work on the complex of buildings that includes the Florence Cathedral, Giotto, Brunelleschi and Alberti are considered the founding fathers of Italian Renaissance architecture. After a lengthy walking tour that had us taking in the unrivaled sculptured statues created by the likes of Michelangelo, the Basilica of Santa Maria Novella, Palazzo Vecchio, Ponte Vecchio and Basilica of Santa Croce, we made one last pass by Il Duomo then crossed the River Arno, located Piazza Michelangelo and enjoyed panoramic views of Florence. 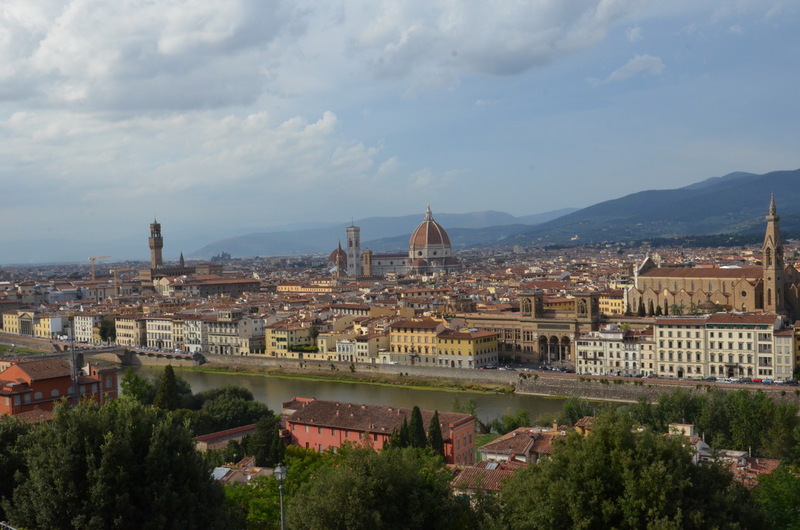 In Bob’s and my opinion, the view of Florence from across the River Arno is the best to be had in that medieval city. 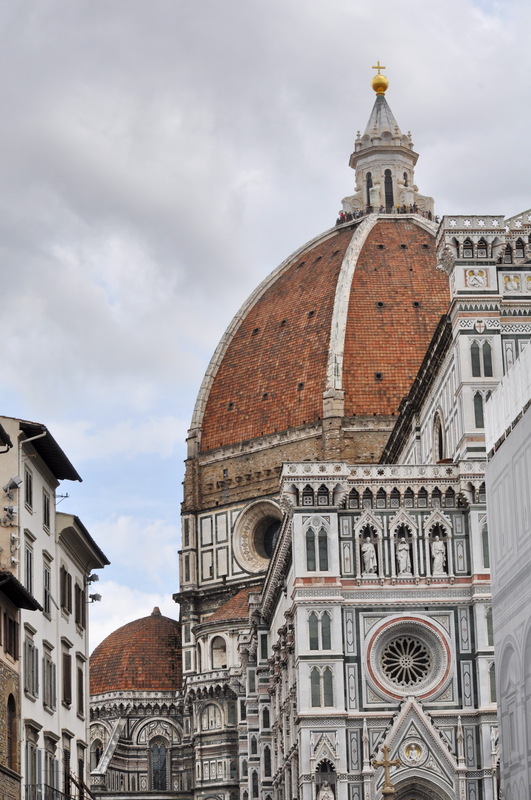 From Piazza Michelangelo, we could see how the sweeping sea of tiled rooftops culminates in the city’s most iconic landmark, The Dome of the Florence Cathedral, Il Duomo. We were satisfied with the final view of the Dome as it stood bathed in sunshine before we departed for the return trip to Gaiole for a restful evening.